Money Today readers give their feedback on the magazine's coverage in the February 2015 issue. 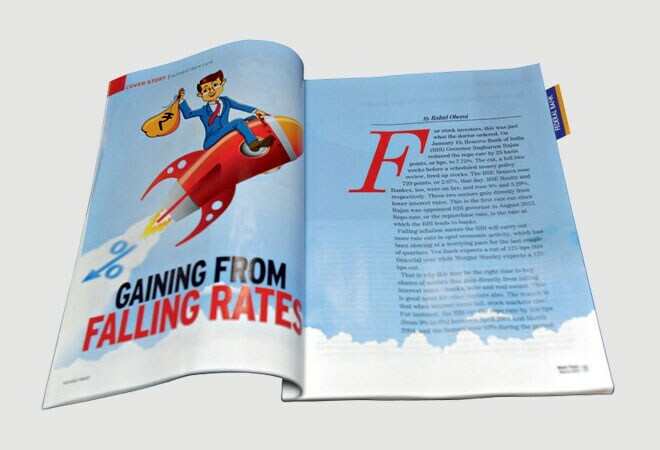 The cover story on rate cuts (Gaining From Falling Rates, February 2015) was an informative article on what investors can expect in the coming days. There is little doubt that compared to the first three months of 2014, the first three months of 2015 have shown a lot of promise for the investors. The fact that banking and financial services will be one of the prime beneficiaries of the cut is encouraging news for the whole economy. No market, or economy, can think of doing well if bank NPAs keep rising. I am not sure if real estate will benefit at a similar level, though. While rate cuts might be passed to customers, the sector's problems are far too big for rate cut to have a clear impact. I believe that with the rate cuts, one sector that investors should consider investing in is auto. A lower cost of borrowing will definitely help the sector, which has suffered from high input costs for the past few years. The story on tax-saving funds (Balancing Act, February 2015) was an interesting read. Most of the times, people look at tax-saving funds as just that: to save tax and nothing more. However, as the story shows, it is important to analyse factors like their exposure to small- and mid-cap stocks and their turnover ratio. As a rule, I never invest in funds which hold a lot of cash. A fund which is unsure about where to invest can never be a good fund in the long run. I also believe that despite the presence of all these funds, PPF remains the most effective way to save tax for most investors. The interview of Hemant Contractor ("Popularising NPS is bit of a challenge", February 2015) was a welcome read, and it was good to hear the PFRDA's chairman's view on the National Pension System. The government's stance on NPS has been far from clear. I am not sure if the previous governments gave much importance to the scheme. The step to tax it, while leaving PPF and EPF tax-free, meant that picking between NPS and PPF was a no-brainer. Why does the government want private players to market the scheme for such a low fee? I believe that sustained advertising, along with making the scheme completely tax free on the lines of PPF, are the only methods by which the PFRDA can popularise the scheme. The story on asset allocation (Juggling Assets, February 2015) did a good job at highlighting investment options for passive investors. Despite a rising economy, I believe that investors will do well to stick to asset allocation funds for investment. I have been investing in Franklin India Dynamic Fund of Funds and it has given me good returns. I do, however, believe that these funds can only be an add-on to a portfolio, not its foundation.